It takes a mere visit to T’ang Court, to understand why this restaurant located at The Langham, Hong Kong hotel has been awarded the coveted Three Michelin Stars for the third year in a row. One of only four Cantonese restaurants in the world to achieve this accolade, T’ang Court has been a Michelin starred restaurant since 2009 and offers an exquisite selection of Cantonese culinary mastery. With Executive Chef Kwong Wai Keung at the helm since the restaurant opened in 1988, the restaurant uses only the best and freshest seasonal ingredients. We loved tasting through chef Kwong’s specialties. To start the chilled South African abalone with jellyfish was perfectly cooked, possessing a delicious tenderness and bite. The fried diced cod fish with honey syrup was similarly delicious. We loved the beautifully caramelised exterior of the fish. 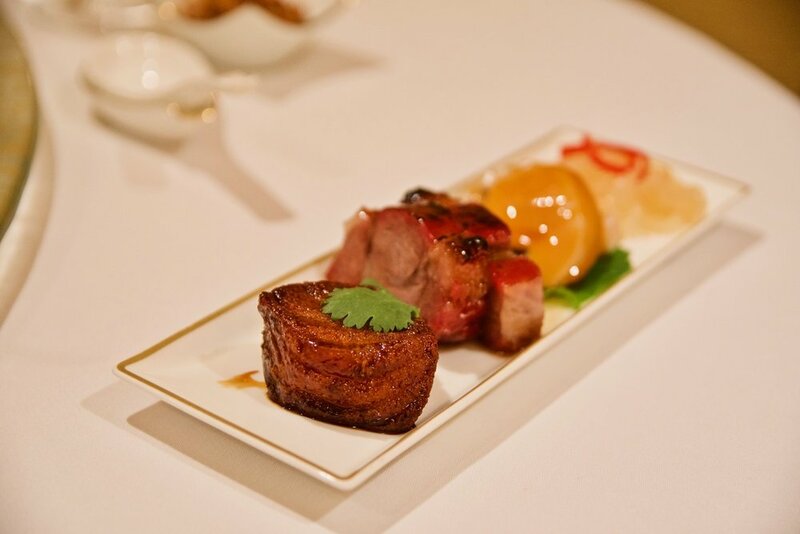 The Cantonese-style barbecue pork was yet another show stopper. Exceedingly juicy, the pork possessed the perfect fat to meat ratio so that each morsel was truly gratifying. For mains the Stir-fried Fresh Lobster with Spring Onions, Red Onions and Shallots (Best of the Best Culinary Awards winning dish in 2002)was beautiful. It was interesting to taste the interplay between the Spring Onions, Red Onions and Shallots – each possessed a unique sweetness that complimented the lobster very well. Next the dish of Baked Oyster with graced our presence. An incredibly large oyster was perfectly battered and served with a lusciously sweet Port Wine jus. It was simply beautiful. T’ang Court’s piece de resistance, the famous Baked Seafood Rice with Cream Sauce in Crab Shell met our expectations admiringly. Think perfectly cooked seafood laced in between beady rice and topped with a cheese and cream sauce that had been baked so it would adorn the rice in the most magnificent, gooey fashion. Our visit concluded on a sweet note with seasonal fruit and T’ang Court’s alluring egg tarts. The pastry was exceedingly short and the filling was wonderfully smooth and simply melted in our mouths. T’ang Court combines culinary excellence, stunning ambience and dedication to providing impeccable service, to deliver a memorable dining experience.